The Service d’Aide started in 1986 (!) with classic caravans with awnings on Les Prairies de la Mer; now we dispose of nine completely wheelchair accessible mobile homes! They are made of wooden (Canaxel style) with double-glazing throughout. In order to maneuver more easily with a wheelchair, there is very little fixed interior furniture. The measurements of the mobile home are 8,5 x 3,5 meters with a wooden terrace (8 x 4,5 meters). Acces by a ramp; a few mobile homes dispose also of a platform elevator. There are two entrance doors: one in the living room with a door opening inwards and one in the large bedroom with double doors opening outwards. Each mobile home is fully equipped for six people (with single quilts and pillows). There is an air conditioner, a microwave oven, a coffee machine (Senseo) and a water cooker. In the living area a table and chairs and a sofa bed (2 persons). Storage cupboard under the large window. 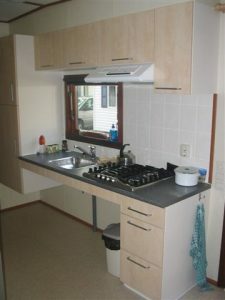 Fully fitted kitchen accessible to a person in a wheelchair. There is a gas cooker, a refrigerator and a washing up sink. There are also storage cupboards (partly wheelchair accessible). There are two bedrooms, separated by sliding doors: in the large bedroom there are two single beds (senior height). There is also the possibility of installing a medical bed in this room. A cupboard for clothes storage is also a standard fitting. In this room there is a curtained-off area containing a high level toilet with foldaway rails and a washbasin. In the small bedroom two people can sleep, thanks to the bunk beds. The lower bunk bed is accessible by wheelchair and the top bunk can be folded away. There is also a clothes cupboard in this room. 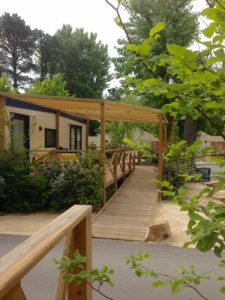 A recently reconstructed toilet block reserved for our clients’ use is situated less than 50 meters from the mobile homes. 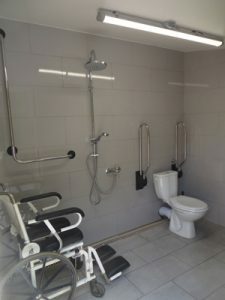 It consists of two units, each with a shower, toilet with foldaway rails and a small washbasin. A shower chair or stretcher is available. Access is at ground level.